Jets goalie Al Montoya makes a save against the Blackhawks. CHICAGO — Al Montoya’s sweet homecoming was one sour night for Jonathan Toews and Co.
Montoya made 34 saves in his first win in his hometown and Andrew Ladd scored his 150th goal, leading the Winnipeg Jets to a 3-1 victory over the slumping Chicago Blackhawks on Sunday. Blake Wheeler had two third-period goals as Winnipeg (25-24-5) won for the second straight day, improving to 6-1 under new coach Paul Maurice. It also averted a season sweep by the Blackhawks, who won each of the first three games between the teams. ”That win right there is just a great sign of character,” Maurice said. Chicago (32-10-12) controlled the first two periods of its last home game before the Olympic break, but still went on to its third three-game slide of the season. The Stanley Cup champions open a seven-game trip Tuesday night in Calgary, and will not play again in Chicago until they take on Pittsburgh at Soldier Field on March 1. Brandon Bollig scored in the first for the Blackhawks, and Corey Crawford had 18 saves. The Blackhawks got Duncan Keith back after the defenseman missed Thursday night’s 2-1 loss at Minnesota because of an illness. But coach Joel Quenneville scratched forward Bryan Bickell, who has struggled since returning from a lower-body injury. Chicago led 1-0 before Wheeler sent a rebound over Crawford’s right glove at 8:16 of the third for his 20th goal. Marian Hossa then had a turnover deep in the Blackhawks’ end, and Ladd buried the open look against his former team for the tiebreaking goal at 12:53, drawing groans from the sellout crowd at the United Center. Wheeler added an empty-netter for his fourth goal in the past four games. Montoya was terrific while subbing for Ondrej Pavelec, who had started the past eight games for Winnipeg. 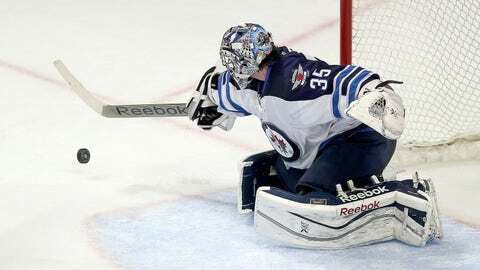 The 28-year-old goaltender shut down the Blackhawks after an early gaffe put the Jets into a 1-0 hole. Bollig got a slick pass from Ben Smith a little more than a minute into the game and skated behind the net for a wraparound as he fell to the ice. The shot went off Montoya’s stick and right pad for Bollig’s sixth goal at 1:21. The Blackhawks had several opportunities to add to the lead in the first, but Montoya was there each time. They outshot the Jets 18-2 in the period. Montoya used his right pad to stop Hossa on a breakaway with 12:05 left in the first, and then stayed in after he was shaken up on the resulting collision with the streaking forward. He also made a sprawling stop on Bollig at the end of the period. It was more of the same in the second, with Montoya stopping Patrick Kane on the right side of the net. The Jets had a chance to tie it with 6-1/2 minutes left in the second, but Crawford used his right foot to kick away a shot by Bryan Little and Ladd’s rebound attempt went off Sheldon Brookbank’s left skate. NOTES: Kane played in his 500th NHL game. . . . Winnipeg scratched C James Wright, D Zach Redmond and LW Eric Tangradi. . . . Jets F Michael Frolik, a key contributor on Chicago’s title-winning team last season, was greeted with a round of applause when he was introduced with Winnipeg’s starting lineup. . . . The Blackhawks have only three wins in their past 10 games.